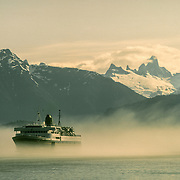 Most of my Alaskan trips started and ended on one of the Alaskan state ferries, either when I was just arriving from England or setting off on a kayaking trip in Southeast Alaska, with my kayak, gear and supplies on the car deck. Alaska is over 650,000 square miles and much of that has no road access. 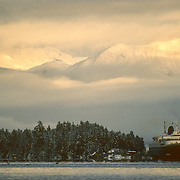 The primary forms of transportation in areas without roads are by air or sea, so the Alaska Marine Highway is a big part of the 'highway system.' It is such a unique set of routes that is has been designated as a National Scenic Byway and an All American Road, the only marine route with this distinction. 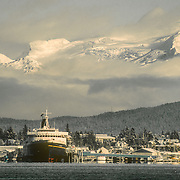 With its southernmost port in Bellingham, WA, the Alaska Marine Highway extends more than 3,500 miles to Dutch Harbor, with over 30 stops along the way. 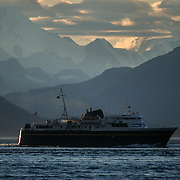 Taking a ferry is an excellent way to see a huge swath of Alaska's coastline while visiting unique communities along the way. Passengers can either travel conventionally in cabins or sleep out on deck in the fresh sea air on reclining chairs or even pitch tents to sleep in, which is what I often used to do. There can be few public means of transportation in the world that provide such an affordable cruise through such breathtaking scenery, with the possibility of viewing whales and other wildlife along the way. In the late 1980's I was fortunate enough to start providing photos for the AMH ferry schedules and other promotional purposes, which provided me with free travel passes for all of my trips. The ferries became a very familiar home away from home for me, especially at the end of a long kayaking trip and being alone in the wilderness for several weeks.